As Annette Kolodny has shown in The Lay of the Land (1975), American colonialist texts imagined the American prairie and frontier as a virgin or bride, waiting to be conquered and mastered. The American unknown land was also imagined as a benevolent mother, who would welcome heroic pioneers to her nurturing bosom. This imagery changed when colonizers realized how they had “deflowered” the virgin/mother land, how it had become mutilated and deformed. 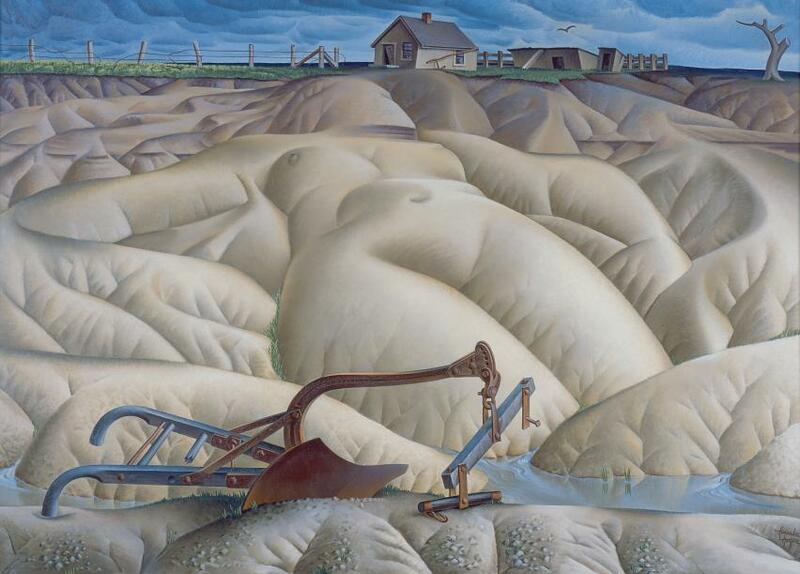 Alexandre Hogue’s painting in the header above – “Erosion No 2, Mother Earth Laid Bare” (1936) – illustrates this sense of disillusionment and visualizes the metaphorization of the land (for the full image, click here). In my project, I suggest that American women writers use conventional metaphors, as the one identified by Kolodny, in innovative and creative ways. They appropriate problematic, confining, and sexist comparisons in order to reimagine what it means to have and live in a female body. I draw on the fact that metaphors are everywhere and that we use them constantly when we discuss abstract ideas. The project is grounded in research on metaphors, narrative, and medical humanities, where metaphors and narrative are understood as central epistemological and cognitive tools in such fields as science studies, psychotherapy, medical anthropology, and palliative care. My text corpus considers novels and short stories by American authors, such as Rebecca Harding Davis, Edith Wharton, Willa Cather, Ellen Glasgow, and Charlotte Perkins Gilman. In these texts, the female body is not instrumentalized to describe a male fantasy or (male) scientific theory. Instead, we can observe a reversal of source and target domain: Cather and Glasgow, for example, use the land as a source domain to describe the female body. The vibrancy, strength, and indomitability of the land thus describe the female protagonists’ bodily nature. Wharton and Gilman also reimagine the conventional notion of the female body. They use the comparison of women to creeping vines and thus to plants who depend on a strong man/tree for support: Wharton’s and Gilman’s protagonists instead have bodies that are strengthened through ‘pruning’ and that have developed strong and deep ‘roots’ that literally and figuratively shake the foundations of the patriarchal domestic ideal. In embedding their metaphors in complex, multi-layered narratives, the authors I examine provide ample material to consider how metaphors are compressed narratives or mini-narratives and, vice versa, how narratives are extended metaphors. The aim of the project reaches beyond the female body and specific literary examples. The purpose is to develop a model of metaphor analysis that joins metaphor theory and narrative theory in order to bring together two fields that have, in the last thirty years, developed profusely but separately, with only a few researchers so far who have started to conceptualize the intersections between metaphor and narrative. You can view and download the project poster here. If metaphors are ideologically fraught and can thus limit what is thinkable and doable, it is crucial to understand that metaphors can be resisted and to develop strategies that help us to creatively rethink metaphors. This is relevant for diverse fields, such as science, medicine, politics, social work, law, and education. In medicine, metaphors are ubiquitous, as ample research shows. Metaphors are used, for example, as mnemonic devices (strawberry bladder) or to explain complex medical procedures or diseases in doctor-patient communication. Some of the basic and repeatedly used metaphors in medicine conceptualize healing as mechanic repair (with the body as a machine), a detective’s work (with the body as a crime scene) or a fight (with the body as a battleground). During his illness, the American literary critic Anatole Broyard, for instance, pondered about illness metaphors. Unsatisfied and uninspired by the conventional metaphors, he started to invent new metaphors. For example, he began to think about his illness as “a love affair with a demented woman who demanded things I had never done before” (21). And he imagines a doctor who had a metaphorical style of his own and would be invested in developing fitting metaphors together with his patient, so that Broyard’s illness would no longer be an anonymous, depersonalized matter, but a space of agency to engage in a nourishing, creative and productive interpersonal quest for meaning and sustenance. As part of the research project, a workshop on medical metaphors will be developed, which addresses professionals in health care. For more information, please contact Dr. Anita Wohlmann.